Am I the only one surprised by how many people are against Transformers being in a shared universe? After taking a long sigh and reflecting on how sad it was that I knew all this, I’ve decided to burst your bubbles (replacement bubbles on the way) because Transformers already takes place in a shared universe. That’s right! Every series including the famous G1, the movies, Beast Wars & TF Animated and even the obscure series like Kissplayers, Shattered Glass & Beast Wars the 2nd take place in the same shared universe. How you may not be asking because let’s face it, you probably don’t care enough about Transformers to ask? Well we can thank Unicron and Primus for this. I apologies in advance for boring you out of your teeth. In the beginning there was the One. In the darkness that was the void, he created the multiverse and two guardians to protect it, Unicron, and Primus who were given different powers. Both are immortal, but Unicron can only live in one universe at a time while Primus lives in all Universes at once. Over time, Unicron became sick of how unorderly the multiverse was and it eventually, it drove him mad. He decided, if he ever wanted peace, he would have to wipe out all of creation until there was nothing left but the void. Unicron was a bit of a control freak as could imagine. As you could probably guess, Primus and the One were not too happy about this and decided action must be taken. The One created the Vok (those weird aliens from Beast Wars) to protect his cowardly self. Primus on the other hand fought Unicron directly, to no avail. In the end, Primus decided to create life of his own. Beings that would protect the universes from Unicron known as the Transformers. Primus and the original 13 Transformers believed themselves successful in defeating Unicron, but the Fallen who secretly joined Unicron sabotaged Primus when he slept meaning he could no longer transform and was forever stuck as a planet that would eventually be known as Cybertron. Of course, you can probably guess Unicron didn’t really die, just that his original body was destroyed. 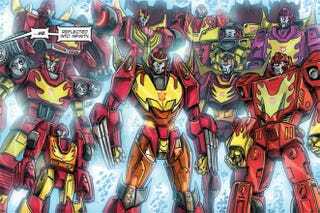 This is when the multiverse goes it separate ways, with the Transformers either living in peace or going to war with each other with no guidance to help them. Unicron, now bodiless, goes into universes and either makes/tricks beings to create him a new but weaker body. Or creates lesser beings with similar powers known as the herald of Unicron to do his evil for him like Sideways, Tarantulas, Thunderwings and the Tripredacus Council. Hell, sometimes he does both. The Fallen is also still around, capable of jumping to universe to universe, causing trouble, usually in the form of creating or allowing the creation of the Decepticons. So there you have it, the shared universe of the Transformers. Again, sorry if this was boring to read, I’ll admit it isn’t the most interesting subject. Also, this is by no means an endorsement for the new Transformers films. They’re likely going to be garbage and I worried they’ll make a mockery of Beast Wars legacy.